There has been a lot of talk lately about Thanos Tzimeros and his new party called "Dimourgia Xana". He recently teamed up with Liberal Stephanos Manos and his party "Drasi" and after merging forces they are now vying for votes at the upcoming June 17 elections.We here at hellasfrappe were very skeptical about this party, and have been checking into their programs for a while now. Thank God we did! After doing some research we found out that that Tzimeros has embraced a pro-FYROM organization here in Greece called "Ouranio Toxo" that literally challenges Greek sovereign rights in the northern region of Macedonia. In other words, Tzimeros has embraced an organization that wants to introduce the teaching of "FYROManian language" in Greek schools, and that calls Florina by the Slavic name Lerin, the town of Edessa by the Slavic name Vonten, the area of Kilkis by the Slavic name "Kouskous", the town of Kastoria by the Slavic name Kastour and the city of Thessaloniki by the Slavic name Soloun! And what is worse... he has embraced an organization which says that Macedonia is illegally controlled by Greece! The same organization was embraced by the eco-Green party and we all know that this party was funded by a Soros-based foundation. Hold on... it gets better. We also found out that some of the members in his party scream out CONTROVERSY and we are guessing that they have teamed up with Tzimeros in order to throw dust in the eyes of right-wing voters who believe that this man actually supports rightest views. 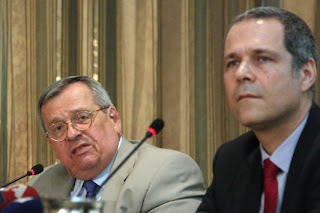 For instance Gregoris Vallianatos (who is running in Athens), was a long-standing supporter and adviser to former prime minister George Papandreou. Then we have civil engineer and columnist, Gousetis Dionysius who is a former member of the Greek Communist Party (KKE), and former candidate with the SYRIZA party as well. Gousetis was one of biggest defenders/supporters of the Annan Plan for the Cyprus issue, which we all know would have destroyed the divided island. He had also advocated in favor of the bombings in Yugoslavia, the independence of Kosovo, and he supports the "Turkish Union of Xanthi". Editor's Note - Before we head to the polls on June 17, it would be wise to read up on the programs, positions and especially the background of some of these people. Be very cautious who you vote for in these elections. People such as Tzimeros... are indeed too suspicious.